When you hold a gem and turn it in the light, it may display flashes of color. This effect is the result of the splitting of white light into the colors of the spectrum. Gemologists call this phenomenon dispersion, but you'll often hear it referred to in the gem trade as fire. The gemstone most famous for its fire is diamond. But in fact there are several less known colored stones which have dispersion ratings even higher than diamond. One of the most striking examples is a rare collector's gem known as sphene. Watch the video above for an example of sphene's remarkable fire. Sphene is a calcium titanium silicate by chemical composition, and is one of very few gemstones containing titanium (benitoite is another). Sphene is typically green to yellow-green or orange, golden to brown in color. The lighter and brighter colors tend to be more valuable because they display more fire. Clarity and cutting also affect sphene's light performance -- clean and well cut stones will be more spectacular with an adamantine (diamond-like) luster. Sphene has a refractive index that is higher than ruby, sapphire and zircon, and on a par with demantoid garnet. If not for the fact that sphene is a fairly soft material -- 5 to 5.5 on the Mohs scale -- sphene would be one of the most sought after stones in the gem world. Due to its very limited availability, sphene has remained a collector's gem that you are unlikely to find in any retail jewelry store. Sphene has been found in Sri Lanka, Pakistan and Madagascar, with most of the current supply of high quality stones coming from Madagascar. Sphene is not enhanced by any treatments. This month we highlight some of the fine gems we'll be featuring at the Hong Kong gem fair this month (see the news section below for more information on the fair). Click on any gem photo to see the details for the gem. 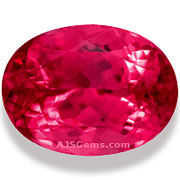 We have been adding many new gem videos to our website. Here are some of our recent additions -- click the links to watch the videos. Hong Kong Jewellery & Gem Fair: AJS Gems will be exhibiting at the 30th annual Hong Fair, September 19-23 at the AsiaWorld-Expo. Our booth number is B35 in Hall 8. This is the premier fine gem and jewelry show in the world, with more than 3,500 exhibitors from around the world. For information on the show and to register online please click here. U.S. Renews Sanctions against Burmese Imports: To the surprise of many commentators, the US Congress has decided to renew the ban on the import of certain Burmese products, including ruby and jadeite. The decision seemed to defy logic since the US has just recently appointed an ambassador to Burma and has removed restrictions on US companies investing in Burma. There is good evidence that Burma continues to make steady progress towards reform, with the lifting of press censorship the latest positive development. The US is now the only country in the world maintaining import sanctions against Burma. The American legislation permits the US President to lift the ban at any time, so we are hoping we will see change after the US election in November. The size measurements refer to the dimensions of each stone. The carat weight, on the other hand, is the total weight of both pieces. It may sound a little complicated, but this is the most natural way to do it, since buyers need to know the size of each gem for setting purposes, and the total carat weight in order to easily compute the cost per carat. The traditional definition of gemstone is a mineral which is beautiful and durable enough to be cut and polished and set in jewelry. Historically, gemstones for jewelry ranged from very hard stones like ruby and sapphire (hardness of 9) to softer materials like opal, turquoise and lapis lazuli (all around hardness 5 to 6). Today there are a number of jewelry designers who are setting softer stones, such as chrome diopside (5-6), apatite (5) and sphene (5-5.5). When you consider that steel has a hardness of around 6, these are not really soft materials. But they can be scratched, and are usually set in earrings or pendants or in occasional wear rings in protective settings.